PARIS --- Although it is not the most favored service in France’s 2019-2025 Military Planning Law (LPM), which earmarks €295 billion to modernize the armed forces, the French air force’s capabilities are due to grow substantially over the next decade. While the number of combat and support aircraft will remain at their present levels, the air force will benefit from the delivery of modern or upgraded combat and support aircraft to replace older models currently in service. In addition, the LPM also funds increased training and operations, so as to maintain aircrew readiness at high levels. Specifically, fighter pilots will fly 180 hours per year – the NATO target – while transport pilots will fly 320 hours per year and helicopter pilots 200 hours/year. There are two major caveats to the LPM. One is that most of the growth to reach the total €295 billion funding will come in 2023-2025, and only €198 billion will be available between 2019 and 2023. This means that sufficient funding is planned to plug most military aviation capability gaps, and to renew a fleet of combat aircraft that have been intensively deployed on combat operations. However, most significant decisions and investments – and most budget growth -- are pushed back to after 2023, the year after the end of President Emmanuel Macron’s term in office. In addition, the highest levels of annual funding is also earmarked for 2023-2025, again after the end of Macron’s term, so there is no assurance that the plan will be fully implemented if he does not win re-election. Finally, the real-term increase in funding until 2023 – 1.7 billion euros per year – will be largely eaten up by foreign military operations, whose entire cost will be borne by the defense budget beginning in 2019 instead of being spread out among all government departments as was previously the case. Alone, this is enough to cast serious doubts on the financial foundations which underpin the French government’s much-ballyhooed Loi de Programmation Militaire (LPM). The current number of 254 combat aircraft in service has been retained, and by 2023 the French air force will operate 55 upgraded Mirage 2000D and 131 Rafale C/D, with another 40 Rafale M in service with the naval aviation component. As shown in the above table, by 2025 France is to operate 254 combat aircraft. These will include 171 Rafales, including 40 Rafale Ms belonging to the navy, and 55 upgraded Mirage 2000Ds, which add up to 226. The difference will be made up by 28 additional Rafales, which will be delivered between 2022 and 2024 – which implies a rate of 14 per year. 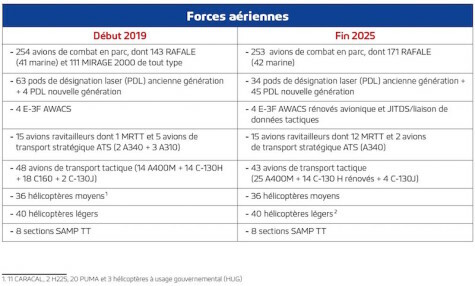 Finally, the LPM also includes sufficient funding to order a new tranche of 30 F4 standard Rafales by 2023, with delivery to take place by 2030. Development work on the F4 is to begin this year. -- the upgrade of the air force’s Mirage 2000D strike aircraft. -- New laser designation pods will be delivered by 2023. -- Upgraded ASTER 30 B1 NT air-defense missiles will be ordered beginning in 2022. When operated together with the successor to the ARABEL fire control system, this missile will give the new-generation SAMP/T air-defense system the capability to engage future threats beyond 2030. -- The first new-generation MICA air combat missiles will be ordered in 2019. -- The new “missile spécifique de l’aérocombat (MAST F), a next-generation dogfighting missile, will be ordered after 2023. -- Programs intended to replace existing capabilities in the field of cruise missiles and anti-ship missiles will be launched in 2024. The development of the French air force’s Future Air Combat System raises the issue of how manned and unmanned platforms will contribute, in a complex, collaborative environment, to all strategic missions. This system is intended to cover the entire spectrum of air combat missions, including air superiority and foreign operations, beginning in 2040. The architecture of a future SCAF will be studied in a European cooperation framework during the course of the LPM. As currently envisioned, SCAF will be a system of interconnected platforms and weapons (aircraft, combat drones, future cruise missiles and other weapons, command and control, intelligence system), centered around a multi-purpose combat aircraft. Choices regarding platform type and partner countries will be made by 2025, and will sustainably orient this structuring program for the future of our air force and our aerospace industry. Several support programs will be funded to improve the capabilities of military aircraft. First of all, the number of Airbus A330 MRTT tanker / transport aircraft will be increased from 12 to 15, while deliveries will be speeded up so as to have the first 12 in service by 2023. The first MRTT will be delivered this year. France plans to make a significant effort to boost its transport capabilities. In addition to the 11 Airbus A400M and two Lockheed Martin C-130J, the French air force will also upgrade its older Lockheed C-130H. The first 14 upgraded aircraft will be delivered by 2025, with another six upgrades to be ordered, for a total fleet of 20 upgraded C-130H. In terms of helicopters, the French air force will operate a fleet of variants derived from commercial designs. The Hélicoptère Interarmées Léger (HIL) will replace all types of light helicopters, including the air force’s Fennec. This program will be launched in 2022, with the goal of delivering the first production examples in 2028; in all, procurement of 169 is planned. -- four unidentified Medium Altitude, Long Endurance (MALE) drones will be ordered, and one delivered. -- a Multinational Space-based Imaging System for Surveillance, Reconnaissance and Observation (MUSIS). -- An ongoing study is evaluating whether the service life of the Transall C-160 Gabriel electronic warfare aircraft should be extended until 2025. Studies in cooperation with Germany, Spain and Italy will be continued with a view to launching the European MALE drone program in 2019, with the delivery of the first system in 2025. Plans call for eight MALE drone systems to enter service by 2030. The LPM funds the renewal of the “airborne nuclear component (aircraft and missile), with a “substantial effort of the ‘information and anticipation’ capability.